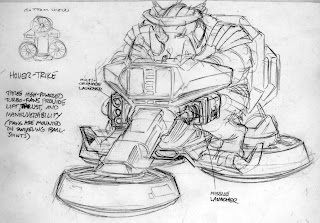 Peter Laird's TMNT blog: Blast from the Past #118: Design for evil mutant's vehicle -- "Hover Trike"
Could this be the prototype for those villainous foot ski's they used i n the show? -->> Neil .. they did develop a toy similar to this effect. The Psycho Cycle or something. I think they reused the mold for a few different ' Hovering Bike ' Toys for both the Foot and the Turtles. I think one issue is that the old line had little articulation, so old Rocky might not have fit on the bike.